Omiagi Bags. Rabbit & Owl. 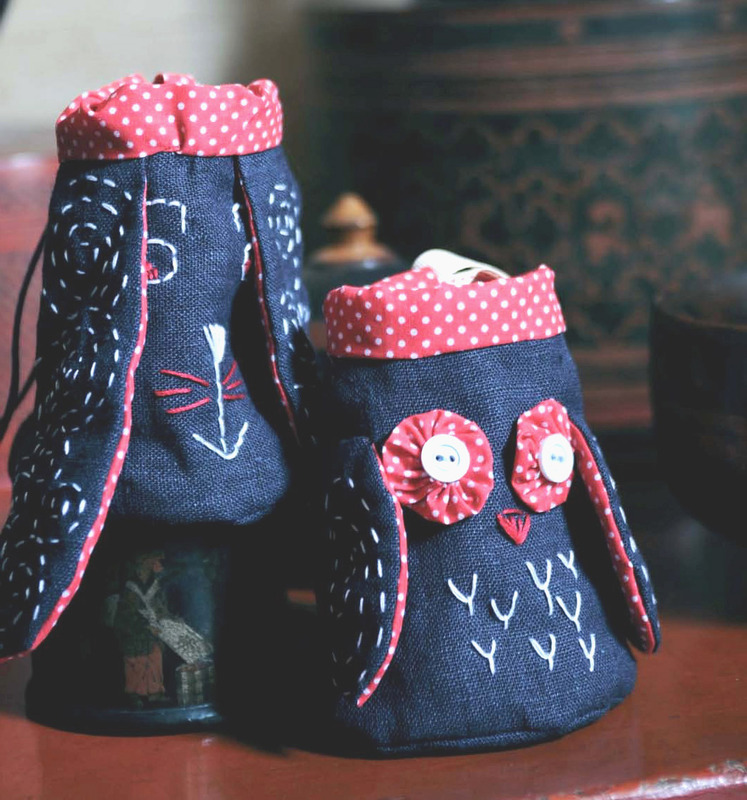 DIY Sewing Tutorial ~ DIY Tutorial Ideas! You may need to snip into curve before turning ears right side out to get a nice shape to ears. 1. From navy cut: one, 6" x 12" rectangle. 1a. Trace base, body and rabbit ear templates given full size on Pattern Sheet onto template plastic and cut out carefully on lines. b. Note templates include 1/4" seam allowance. red polka dot – one body, one base and two ears. 3a. Take navy ear pieces and draw line 1/4" from edge with fabric pencil or chalk marker. b. Using fabric marker, draw loose spirals to fill space within 1/4" drawn lines on each ear. 4a. Take three strands of embroidery thread, or white sashiko thread, stitch along spiral lines with running stitch, illust. 1.
b. Set ears to one side. 5a. Take 6" x 12" navy rectangle and centre body template on rectangle. 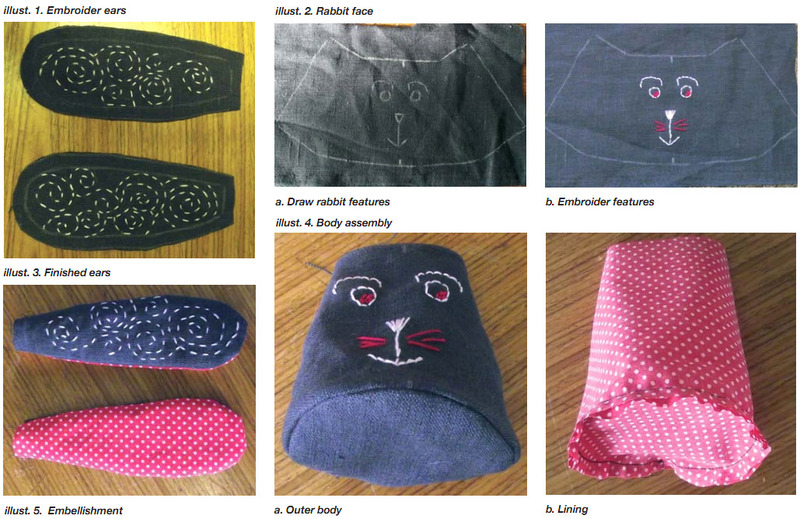 c. Mark centre of body on top and bottom edges and then draw rabbit face with removable fabric marker, dia. 1 and illust. 2a. d. Embroider face with red and white threads using back stitch, illust. 2b. e. Cut out navy body on outer edges. 6a. Place lining ears right sides together with stitched navy ears and pin. b. Stitch around edge of ears leaving top edge unstitched. c. Turn ears right side out, illust. 3. 7a. Fold embroidered body right sides together and stitch along short side to create tube. b. Stitch body tube to base and turn right side out, illust. 4a. 8. Make lining in similar manner but leave wrong sides out, illust. 4b. 9a. Trace Suffolk Puff template given full sizeon Pattern Sheet onto template plastic and cut out on line. b. Draw a round template on red polka dot and cut out on line. c. Fold in scant seam allowance around edge of circle and run line of small running stitches around outside edge. d. Pull thread gently to create Suffolk Puff. e. Ensure gathers are evenly spaced before securing thread. f. Stitch Suffolk Puff to base of seam on navy body, illust. 5a. 10a. Insert lining into outer bag, matching back seam. b. 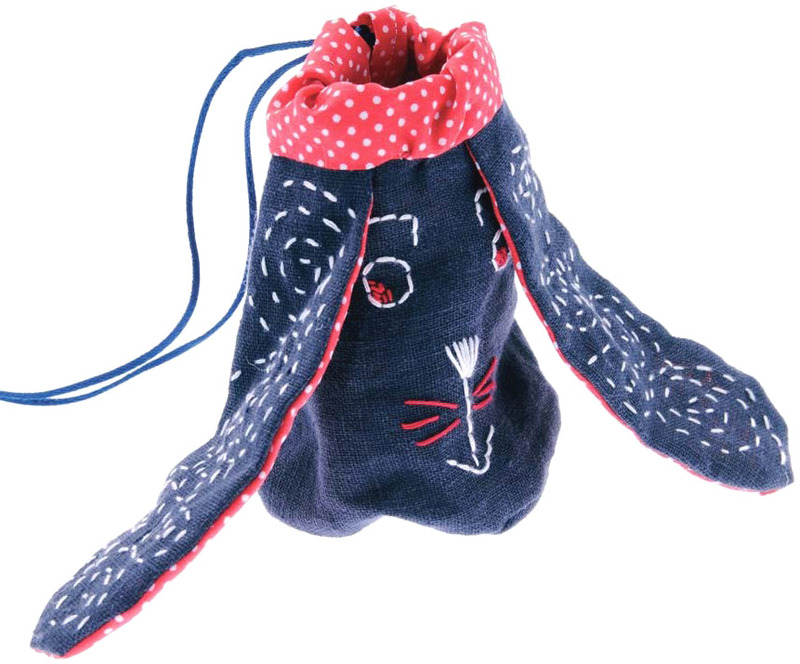 Position ears on bag ensuring they are slightly covering eyes and then pin in place, illust. 5b. 11a. Take 2 1/2" x 8" red polka dot strip and make small hem at each end, illust. 6a. b. Pin strip right sides together with top edge of bag and stitch around edge. c. Ensure ends of strip just meet at back. 12a. 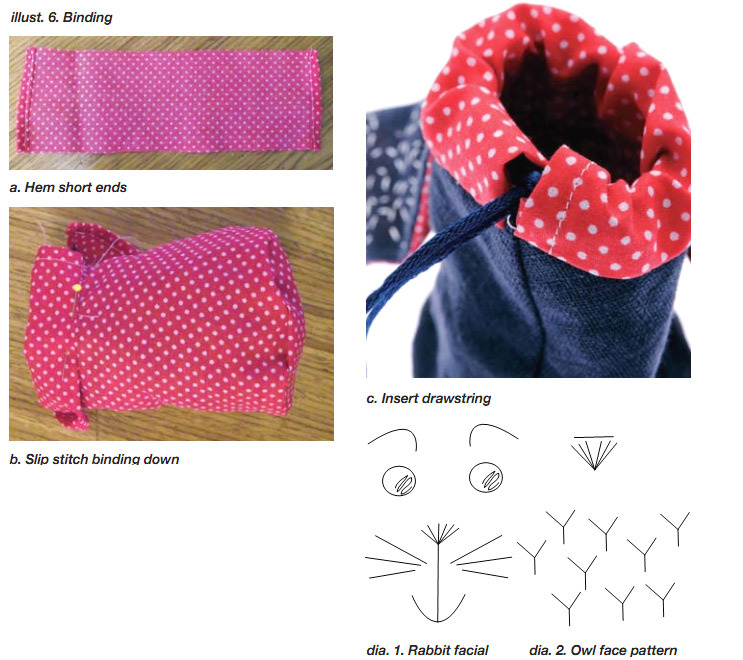 Fold bag inside out and slip stitch binding in place, illust. 6b. b. Allow space for drawstring to be threaded through. 13. Turn bag right side out again and insert ribbon or cord through binding to create drawstring, illust. 6c. 1. 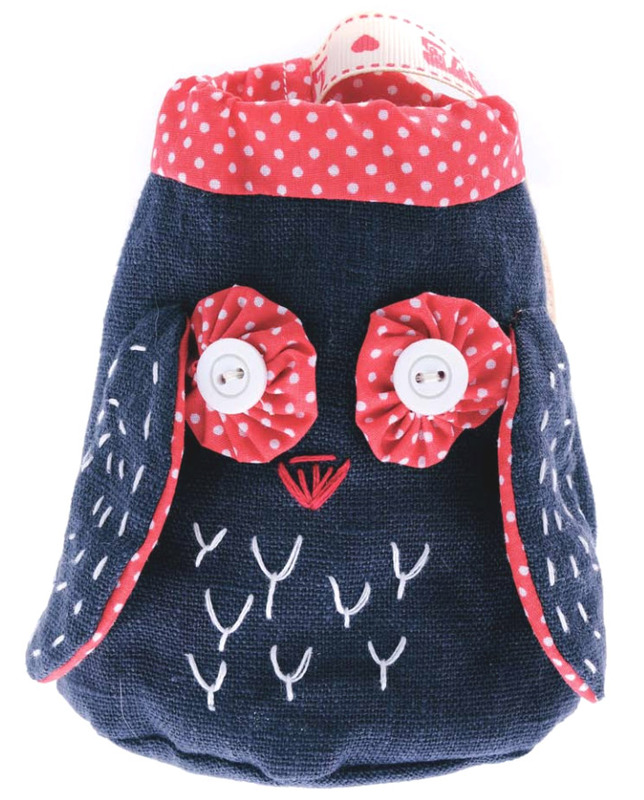 Owl is made in same way as rabbit. 2a. Trace owl wing template given full size on Pattern Sheet onto template plastic and cut out on lines. b. Make owl wings in similar manner to rabbit ears. c. Attach wings to sides of body. 4. Make Suffolk Puffs for eyes and join to body with buttons, illust. 7b.